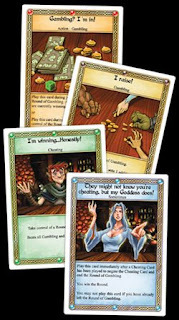 The Red Dragon Inn is a simple, but nevertheless very interesting and entertaining card game for two to four players. The heroic adventurers meet in a pub (called "The Red Dragon Inn") and celebrate their survival in the dungeon - by drinking a LOT of delicious drinks. Your goal is to stay conscious (at least longer than the other players) and to be successful during gambling (to not loose all your gold). 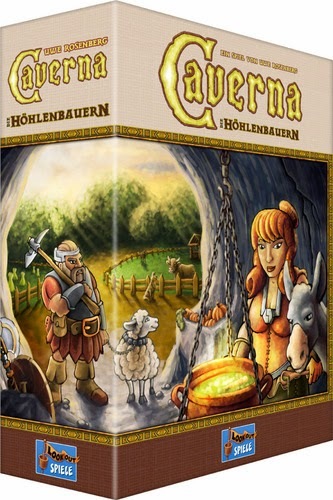 The game mechanics take care of distributing the different drinks to the players (which can be influenced by the adventurers of course) and regulate the gambling-procedure, which is a kind of game-in-the-game. 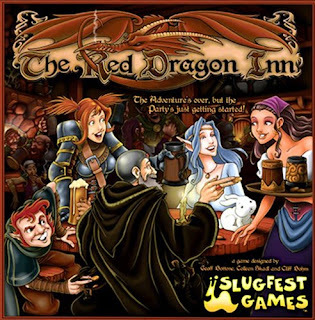 The Red Dragon Inn is easy to teach and really a lot of fun, especially for three or four players - as there is a lot of interaction, and future happenings are pretty hard to predict. From the publisher: You and your adventuring companions have spent all day slogging through the Dungeon, killing monsters and taking their stuff. Now you're back in town, healed up, cleaned up, and ready to party at the Red Dragon Inn. Take on the role of one of these heroic fantasy adventurers - Dierdre, Fiona, Gerki, or Zot - and enjoy an evening at the Red Dragon Inn!